You're designing an electromagnet, for example, and need to calculate the number of turns, or you might already have a coil and want to know how hard it will pull on a nearby piece of iron. These are simple questions. Although the answers are elusive this page outlines some general principles and pointers towards specific solutions. The energy in a magnetic field. 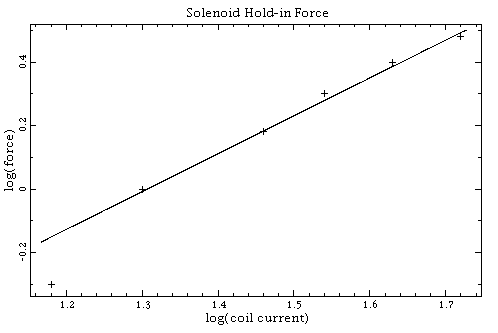 A simple experiment with a solenoid. One method of calculating the force produced by a magnetic field involves an understanding of the way in which the energy represented by the field changes. To derive an expression for the field energy we'll look at the behaviour of the field within a simple toroidal inductor. We equate the field energy to the electrical energy needed to establish the coil current. When the coil current increases so does the magnetic field strength, H. That, in turn, leads to an increase in magnetic flux, . 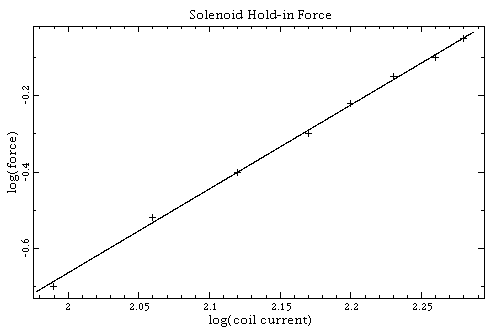 The increase in flux induces a voltage in the coil. It's the power needed to push the current into the coil against this voltage which we now calculate. 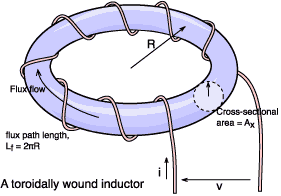 We choose a toroid because over its cross-sectional area, A, the flux density should be approximately uniform (particularly if the core radius is large compared with it's cross section). We let the flux path length around the core be equal to Lf and the cross-sectional area be equal to Ax. We assume that the core is initially unmagnetized and that the electrical energy (W) supplied to the coil will all be converted to magnetic field energy in the core (we ignore eddy currents). Another squared term, you notice. A 'hand-waving' explanation might help clarify the physics. Take an initially uniform magnetic field in free space and introduce into it an iron sphere. The flux lines will bend in the vicinity of the iron so that they will converge upon it. Inside the iron the lines will be quite concentrated (though parallel to the original field). Now, the point is that there will be no net force on the iron, no matter how strong the field. A sphere has perfect symmetry, so rotation will not change the picture in any way. If there is translational movement then all that can happen if the sphere were to move is that the distortion of the field around the original position of the sphere will disappear and the same distortion will be re-established around the new position; the total system energy will remain unchanged. OK, instead of the sphere let's try an iron rod. This is different because we've lost symmetry. What happens is that the axis of the rod will be drawn into alignment with the field - like a compass needle. The flux lines prefer the iron to the air because of the higher permeability. Equation EFB has μ on the denominator so the field energy is lower here than in the air, and the further the flux can go through the iron the lower the energy. Think of current flow through a resistor; the current has an easier time going through a low resistance than a high resistance. Flux goes easier through high permeability than through low. When the rod is aligned with the field the flux can go further through a high permeability region. Note that we still don't have a translational force (provided that the field is uniform on the scale of the rod). Think about the famous experiment with iron filings sprinkled onto a piece of cardboard above a bar magnet. The filings tend to line up with the field but don't generally move much because they are so small that the field appears uniform to them. where I is the coil current and x is displacement in metres. This result is proved in textbooks such as Hammond, and also Smith. Unfortunately, it might be tricky to calculate how the inductance changes unless the system you have is particularly simple to analyze. You might need computer software such as described by Hammond in order to do it. Some problems of practical importance can be solved when the air gap between the electromagnet and the work piece is small in comparison with the field cross section. This is the situation found in most electromechanical relays. If you have ever tried to bring a piece of iron into contact with a magnet manually then you will quite literally have a feel for the g2 term! Example: A relay has a coil of 1200 turns. The diameter of the coil core is 6 millimetres and the air gap is 1.8 millimetres. The spring exerts a force on the armature of 0.15 newtons at the part of it opposite the air gap. What coil current will operate the relay? Therefore I = 0.138 amps. The flux density will be 0.116 teslas. This should be well below saturation for iron. As the gap closes, and g goes to zero, equation FRS predicts that the force on the armature becomes infinite. Of course it won't do so because our assumptions about the field production will go down the tubes first. Under those conditions it might be far harder to calculate the force precisely. One point to note, though, is that flux density is limited by saturation to below about 1.6 teslas. Maxwell's force formula therefore sets a limit on the force of one million newtons per square metre (about 100 tons). where l is distance and v is the volume of the material. It needs emphasizing that this formula will give significant overestimates for ferromagnetic materials. For them the internal 'demagnetizing field' leads to lower values of force than equation FRL would suggest. Demagnetizing fields only have exact analytical solutions for spheroidally shaped specimens. Consult a text such as Jiles for details on correcting for demagnetizing fields. Set a high coil current by turning the power supply up towards 12 volts. Push the plunger in until it is retained by the field. 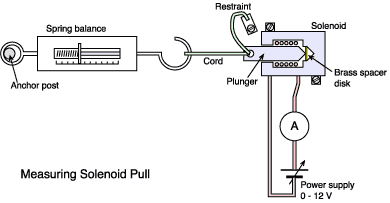 Reduce the length of the cord until either the balance reads maximum load or the solenoid just retains the plunger. A turnbuckle is handy here. Make a note of the force measured by the balance. Repeat the sequence, slackening the cord on the balance each time to obtain a lower force. This gave the line, shown below, which has a slope of about 1.1. Notice that the retaining force is now much lower even though a higher coil current has been used. Well, this line has a slope of about 2.2 - a bit closer to theory. In an air gap the flux density is exactly proportional to field strength (and thus current). As far as a static magnetic field is concerned brass behaves just the same as air: the permeability is a steady μ0 at any value of B. It would be nice to extend this experiment by a measurement of coil inductance against force in order to test Equation EFS. The difficulty is that inductance meters use AC test signals. Without laminated iron (which is only found in solenoids designed for AC operation) the reading will be affected by large eddy current losses. Last revised: 2010 July 8th.